Not everyone gets the opportunity to learn from Arthur Rubinfeld in person. But, everyone can learn directly from him by reading Built for Growth: Expanding Your Business Around the Corner or Across the Globe. In it, he shares insights about retail business, including brand, location, people, finance, property management, and expansion strategy to help small or large companies build for growth. "When I was starting out in the retail business a long time ago, first working for my father's clothing store and then starting a couple of retail businesses with my brother, I could have benefited from this book by Arthur Rubinfeld. 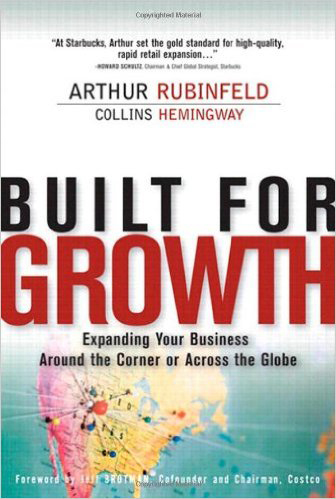 Built for Growth: Expanding Your Business Around the Corner or Across the Globe is a valuable primer on all aspects of retail: brand, location, people, finance, property management, expansion strategy, and long-term thinking. He understands the difficulty of the small guy getting started and the big guy keeping the brand fresh. This book contains a lot of information that will not be obvious to most people. Even an experienced retailer should stop and reflect on Arthur's insights, which come from many years of experience in every aspect of the business." "It's an intense examination of what goes into conceptualizing a viable retail plan. Whether it involves serving sushi on a conveyor belt or selling sunglasses, he explains how to grow a franchise into a powerful marketing presence. From the initial "ideation" and differentiation of the concept, to choosing the right location for the first store, making the design and merchandising decisions, and attracting venture capital-Rubinfeld walks anyone who wants, or needs, to understand retailing through the thought process at every decision-making opportunity." "But it is the anecdotes from Starbucks' evolution, and from Rubinfeld's subsequent career as a brand development consultant, that drive the book forward. From store design and location to "high touch" customer service, the brand's expansion provides the paradigm for the value of combining imaginative planning with hard-nosed execution." 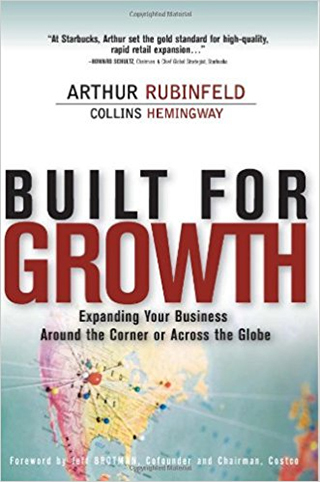 To read the full text of the reviews, please scroll down to the Editorial Reviews section of the Amazon Built for Growth: Expanding Your Business Around the Corner or Across the Globe page.